Is your first and second favorite animal a horse? Is your bedroom covered with horse posters on your walls and horse models on your shelves? Would you rather muck out a stall than clean your room? 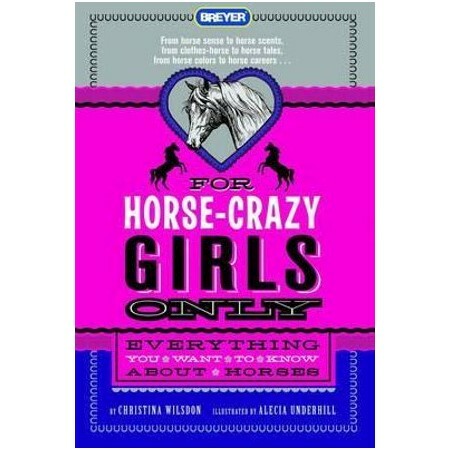 Then you are absolutely, undeniably horse crazy, and this is the only comprehensive book about everything a horse-crazy girl needs to know about horses. You'll learn everything from the different breeds of horses, to how a horse's body works, to the quirky little things that make the horse the BEST animal ever. There are even ideas for horse-themed parties, and suggestions for the best horse movies to watch with your friends. And that's just the beginning. Christina Wilsdon s a horse-crazy mum with an even horse-crazier twelve-year-old. She lives with her family in Seattle. Alecia Underhill grew up riding horses. Now she lives in Connecticut with her husband and son, as well as a Morgan mare, an English shepherd dog, and a flock of chickens.